Shocked that there wasn’t a line when I went to get stamps. But the post office is mostly closed and google didn’t have any answers! Any ideas? I have nary a clue. However, I am certain this will have some very (READ: NOT) fun ramifications for this upcoming holiday season. If anyone reading this has the 411 on what is going on here please share via comments or email at: missheather (at) thatgreenpointblog (dot) com. Thanks! UPDATE, November 20, 2012: We have an answer! 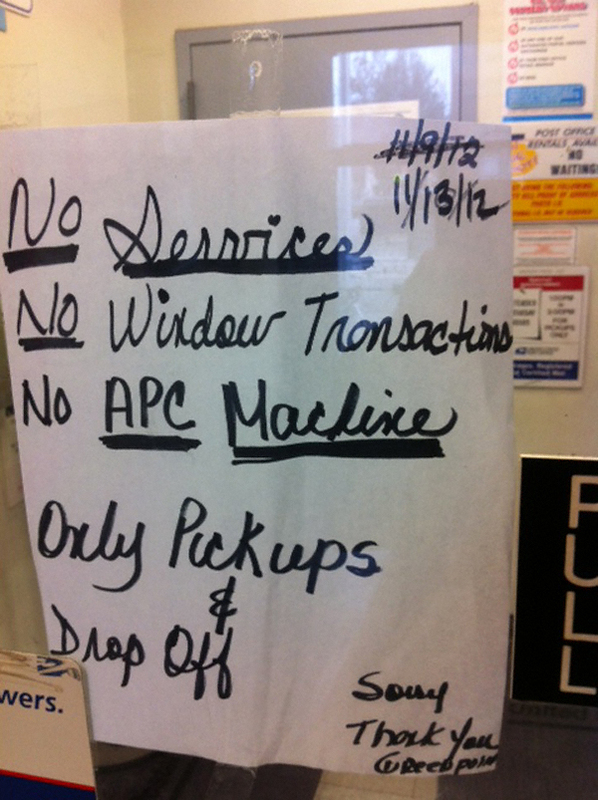 due to the storm, and some type of computer failure, many post offices in brooklyn where shut down. there was a major verizon internet failure, and the computer system went down, and believe it or not they can not sell stamps without computers, cause they dont trust the employees not to steal.. ..